There’s a theme in the PSG media at the moment, and that theme is SALES. After all the fun of the Neymar shopping trip, the reality of FFP is hitting home and the debit cards starting to feel a little scorched. This can all be sorted by selling off a big bunch of fringe players for big fees, but for that to happen there needs to be buyers ready and willing, and this is where PSG may have a problem. Every club knows PSG want to offload players, so will automatically try and get a bargain, it’s the way of the transfer world. L’Equipe have a look at the situation in their Wednesday edition, and Chelsea are brought in. Not for the first time, Grzegorz Krychowiak is linked with a move to Stamford Bridge. Chelsea were ready to invest in the player, and even asked PSG about the midfielder’s personality. L’Equipe believe that PSG’s ‘lack of responsiveness’ played a big part in a deal stalling. PSG, as explained by the French newspaper, were rather busy with more exciting things at the time. It’s all a little arrogant to say the least, and now PSG want a buyer. 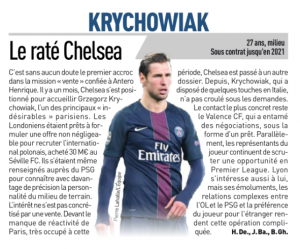 Krychowiak prefers a move to the Premier League, and the ideal PSG scenario is Chelsea waltzing in and getting a deal done, with PSG this time bothered enough to show a good level of courtesy.